AMSTERDAM (AFP) - Almost four centuries after Dutch master Rembrandt painted a young married couple, their two portraits are back home in the Netherlands thanks to a unique joint 160 million euro ($178 million) purchase with France. Dating from 1634, the portraits show wealthy Dutchman Marten Soolmans, 21, and his new wife Oopjen Coppit, 23, both wearing black with white lace as they mark a year of marriage. “It’s the first time that they are in public hands, and can be seen” by millions of people, the director of collections at the Rijksmuseum in Amsterdam, Taco Dibbits, told AFP. In a historic deal in January, France and the Netherlands agreed to jointly buy the two large Rembrandt tableaux for 160 million euros from the French branch of the Rothschild family -- one of the world’s wealthiest and most influential art collectors. After several months on show in the Louvre in Paris, they were unveiled at the Rijksmuseum in Amsterdam on Friday ahead of an exhibition opening Saturday. The paintings have been in private hands for almost four centuries, and have belonged to the Rothschilds since 1877. Prior to going on show in the Louvre, they had only once been seen in public in 1956. 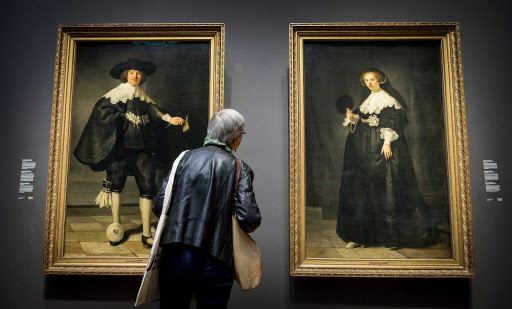 The Rijksmuseum -- which is hanging the portraits next to Rembrandt‘s seminal work “The Night Watch” -- hopes millions more will come and marvel at the pictures until the exhibition closes on Oct. 2. Towering more than 2 meters in height, they almost resemble “black and white photographs,” said Dibbits, with Rembrandt creating a third dimension thanks to his use of light and shade. Marten is seen holding a leather glove in his left hand, while Oopjen’s belly is already rounded, showing she is expecting their first child. After the Amsterdam exhibition, the paintings will be renovated and then go back on show in the Dutch capital for five more years, before returning to the Louvre for the next five.